Have Your Root Vegetables and Eat Them, Too! With winter upon us, you might find yourself wondering what vegetables you should be eating. The answer? Root vegetables! While certain root vegetables (such as white potatoes) are not recommended for bariatric surgery patients due to their high carbohydrate content, there are plenty of other (less starchy) options to choose from this winter season. Root vegetables are high in fiber (1 cup of cooked carrots has 5 grams), low in calories, and chock full of antioxidants that provide additional health benefits. 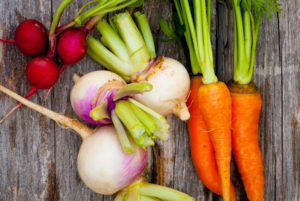 Some root vegetables to try this season include: beets, turnips, rutabaga, and radishes. Beets: Studies have shown that eating beets (also known as beetroot) may help fight chronic inflammation, reduce blood pressure, and possibly even improve athletic performance . In addition, this vegetable is high in fiber, which promotes regularity and reduces constipation (note that eating beetroot can cause red urine or stool). Beets can be roasted, steamed, or eaten raw. Add them to your salad or coleslaw, pair them with goat cheese or fruit, or get creative and make beets into a pesto or horseradish. TIP: the beetroot greens are edible as well! Turnips: Turnips contain just 34 calories per cooked cup, making this vegetable ideal for those watching their weight. In addition, turnips contain a phytochemical called sulforaphane (a compound that gives cruciferous vegetables a bitter taste), which studies have shown may block carcinogens . Not sure what to do with turnips? Try this creamy turnip soup recipe from Eating Well. Enjoy! Rutabaga Not to be confused with a turnip (rutabaga is larger with a rougher skin), this vegetable packs in approximately 50% of the daily recommended value of vitamin C in just one cup! Rutabaga tastes great roasted, mashed, or through a spiralizer (if you’re getting sick of zucchini noodles). TIP: Rutabaga from the store usually has a wax coating on it which needs to be removed before cooking. Radish: One radish has only one calorie, so one can consume this vegetable without any guilt. Add this vibrant-colored food to tacos, eat as a snack with low fat ricotta cheese, or try this high protein entrée from Real Simple: Chipotle Shrimp with Radish and Jicama Salad.